Windows 7 32-bit BETA – This package supports USB 2.0, USB 3.0 and PCIe frame grabbers. Includes DirectShow integration. Windows 7 64-bit BETA – This package supports USB 2.0, USB 3.0 and PCIe frame grabbers. Includes DirectShow integration. Windows XP 32-bit This package supports USB 2.0, USB 3.0 and PCIe frame grabbers. 3.29.0 version adds support for HDMI Audio in DVI2USB 3.0 frame grabber. Includes DirectShow integration. 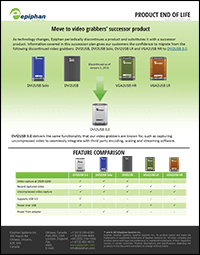 Windows Vista 64-bit This package supports USB 2.0, USB 3.0 and PCIe frame grabbers. 3.29.0 version adds support for HDMI Audio in DVI2USB 3.0 frame grabber. Includes DirectShow integration. Download 3.30.1.10 Mac OS X 10.9 – 10.10 BETA – QuickTime/CoreMediaIO component and Epiphan capture software. Supports network, USB 2.0, USB 3.0 and PCIe grabbers, 32-bit and 64-bit kernels. Download 3.28.4.1 Mac OS X 10.7 – 10.9 BETA – QuickTime/CoreMediaIO component and Epiphan capture software. Supports network, USB 2.0, USB 3.0 and PCIe grabbers, 32-bit and 64-bit kernels. Download 3.28.0.15 Mac OS X 10.4 – 10.9 QuickTime/CoreMediaIO component and Epiphan capture software. Supports network, USB 2.0, USB 3.0 and PCIe grabbers, 32-bit and 64-bit kernels. Download 3.28.0.12 Mac OS X 10.4 – 10.8 QuickTime/CoreMediaIO component and Epiphan capture software. Supports network, USB 2.0, USB 3.0 and PCIe grabbers, 32-bit and 64-bit kernels. Download 3.7.22 Mac OS X 10.3 (PowerPC) QuickTime component and Epiphan capture software for PowerPC based Mac OS X 10.3 computers. Does not support network and PCI grabbers. Download 1.0.10c Mac OS X 10.3 (PowerPC) This package contains drivers for PowerPC based Mac OS X 10.3 computers. Download – Linux Distributions Pre-compiled drivers available. This product is compatible with Linux (i386 and x86_64). The driver supports V4L (Video4Linux) interface along with specialized interfaces designed by Epiphan. Although we provide a Linux SDK (API for driver and examples), we do not provide source code for the driver itself. We provide binary drivers for major Linux distributions (Fedora, RedHat, CentOS, Ubuntu, Debian, SUSE). Please contact us in advance of purchase to verify that we can support any other kernel or distribution. 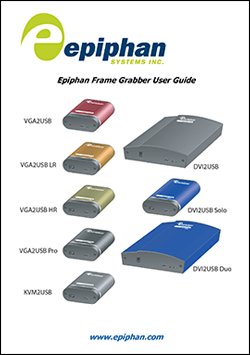 Download 3.30.3 C and C++ Epiphan video grabber SDK for Windows 8.1, Windows 7, Windows Vista, Windows Server 2000, Windows XP, Linux, and Mac OS X. SDK contains unified frmgrab API for USB, PCI and network video grabbers. Download 3.27.1 Java DVI2USB 3.0 Java interface and example for Windows, Linux and Mac OS X. Supports USB and network video grabbers. 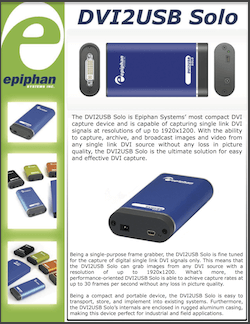 End-user Customers (“You”) who buy Epiphan’s products listed hereafter (AV.io HD, AV.io SDI, AV.io 4K, DVI2USB 3.0, SDI2USB 3.0, VGA2USB, VGA2USB Pro, DVI2USB Duo, DVI2PCIe Duo, DVI2PCIe, KVM2USB and VGA Splitter), directly from Epiphan, may return them to Epiphan up to 30 days after You received them, for a refund of the product purchase price (Epiphan cannot refund shipping charges). End-user Customers must obtain a RMA number that is clearly marked on the outside of the return package and all returns must be in the original packaging and include all items. Returns under the 30 day return policy will be subject to a fifteen percent (15%) restocking fee unless otherwise prohibited by law. All other Epiphan’s products not mentioned herein, are excluded from the 30 day products return policy.